The Modern Maker Vol. 2: Pattern Manual 1580-1640: Men's and Women's Drafts from the Late 16th Through Mid 17th Centuries. 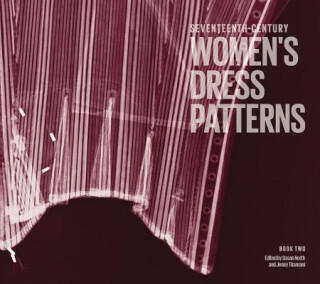 Book Two in the V&A's groundbreaking new series presents 17 patterns for garments and accessories from a seventeenth-century woman's wardrobe. It includes patterns for a loose gown, a jacket, a pair of stays and a boned bodice, ivory and wooden busks, shoes, a hat, a stomacher, linen bands and supporters, a bag and a knife case. It also features a description of the stay-making process. Full step-by-step drawings of the construction sequence are given for each garment to enable the reader to accurately reconstruct them. There are scale patterns and diagrams for making linen and metal thread laces and embroidery designs. Multiple photographs of the objects, close-up construction details and X-ray photography reveal the hidden elements of the clothes, the precise number of layers and the stitches used inside.